mémoire involuntaire no. 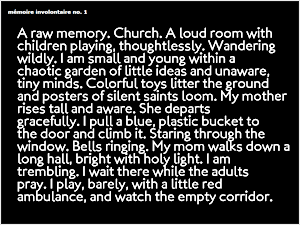 1 is a vignette from the perspective of a small child, a "raw memory" of playing with toys while the adults attend a church service. As the text progresses, select words are replaced, such that "holy" light mutates to become "dedicated," "holy" once again, then "beatified"; "adults" become "suspects"; "staring" becomes "eyeballing," "eying," "peeking," and so on. Objects are unmoored from place and time, making a concretely rendered scene instead impressionistic. As the text shifts, the memory itself shifts. What was for one brief moment a static and contained moment in time becomes diffuse, dynamic, and mutable. One can see traces of John Cayley's "kinetic language painting" in this text, both visually and conceptually. While the former engages processes of signification and translation, the concern of mémoire involuntaire no. 1 is the operation of memory itself. Author description: This text begins as a short memory, recalled and composed by the author. Periodically and involuntarily the words are replaced in real-time by synonyms and coordinate terms extracted from the Wordnet database. After a certain amount of time has elapsed the text enters a second state where it attempts to "remember" its original form, where the text longs to reconstruct the original memory as it was first remembered and composed. In this state (in which it ceaselessly remains), the text attempts to cycle back through the word replacements and is more likely to "remember" than "forget," although there exists the possibility that the text will drift toward new replacements, new significations. As Walter Benjamin once wrote, "Memory is not an instrument for exploring the past but its theatre." Indeed, this text is an experiment in the involuntary performance of memory - forever departing from the moment of its inscription while forever attempting to return to the script and source of its unfolding. Additional credits:mémoire involontaire no. 1 uses p5js and the RiTa library (with WordNet) by Daniel C. Howe.